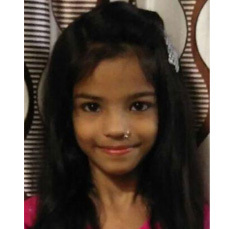 We request you to support 9 year old Manisha Singh. This child has undergone an Open Heart Surgery in November 2013. Now she wants to continue her studies and become an independent girl like other children. She is studying in 3 rd standard. She is very enthusiastic and participates in all school competitions. Manisha’s father does not have stable job and is running in financial crisis and for him managing the cost of her education is difficult. Child Help Foundation depends on the generosity of individuals to offer help to Manisha and educate this girl child. Child Help Foundation (CHF) is a national non-profit organization dedicated to help needy and neglected children. Child Help Foundation is registered under Bombay Public Trust Act 1950. Reg. No E-6427/Thane/2009-10. All donation to Child Help Foundation are exempted from tax under section 80-G of Income Tax act.